Soak Brown rice for minimum 4 hours and then cook with 4-5 cups of water until done, then drain the water using colander,drian completely and spread in a plate and keep aside until use. Wash n chop veg to deisred shape n size and keep ready. Heat oil in a tawa, add tempering ingredients and wait till it pop. Then add ginger-garlic paste and saute till raw smell leaves and add onion n mint leaves and saute for 1-2 minute. After that add tomato and saute till it turns soft and tender. And then add mixed vegs n turmeric powder and saute for 1-2 minutes and then add chili n garam masala powder and stir fry in medium heat and cook covered for 3-4 minutes or until turns tender but not mushy. Now add cooked brown rice mix everything well and again cook covered for a minute. Lastly add few chopped cilantro, mix gently and leave it to set for few minutes(so that the flavors blend completely). That's it...Tasty Mixed Veg Brown rice Tawa Pulao ready. Serve Hot with Raitha. Instead of brown rice you can also use white Basmati Rice. Use any desired vegetables,don't cut them completely maintian its crunchyness for more taste. When i saw whole grains.. i did think it just goes with your theme! Wow sangee..lost weight & working out.. Lifestyle changes always inspires me.. I am yet to develop a taste for brown rice.. love the color combo & heartiness of veggies :)..look fwd to other dishes u come up with! Great that you have lost some weight, I have only managed to gain :(. Keep it up! And such a yummy looking pulao! rice look fantastic. happy to see your whole grain recipes in next few days. Wow, such an healthy dish. Looks awesome. I love your photo of colored pulao with B&W background. Lovely!!! good one...i am always looking for dishes with brown rice....this is going on that list! Great rice! Love the step by step pics! Looks good, lucky girl you lost weight, even I like the brown basmati..
Looks tempting and healthy...love the color of the pulao. Brown rice tava pulav is very inviting and healthy. Lovely presentation. Good to hear about your fitness routine. very nice idea to mix veggies with brown rice.. love d combo..
very colorful and flavorful indeed! tawa pulao looks fabulous dear !delicious! Pulao looks awesome..that's a great news about your weight program..keep it up..
Love tawa pulao! The black n white pic with pulao highlighted in color is awesome! sangee it looks wonderful and its a very healthy option too!! That is absolutely great to hear Sangee. Wonderful and healthy preparation. 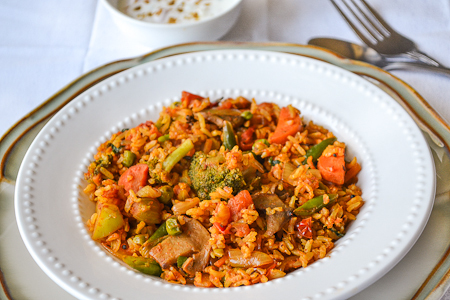 Healthy rice with lots of veggies. Really i can also follow and bring down my weight. thanks for sharing. love the colours and thank you for the encouraging comments .. have sent the entry to summer splash..
Pulav looks so colourful and healthy!!!!!! Love the healthy version of pulav. It looks delicious and colorful. Nice and colorful recipe.. Yummy !! I eat Brown Rice for my daily lunch, this looks so colorful n healthy,Bookmarked!!!!! Blueberry Mocktail ~ With Mint touch ! !